Organic Sinus Lift – Bone Graft Using Your Own Body’s Materials! In 2103, Japanese colleagues published astounding research results regarding their patients. What was so remarkable was that they were able to eliminate the need for foreign substances in bone grafting associated with sinus lift surgeries. For jaw bone augmentation, fibrin (PRF – platelet rich fibrin) sourced from the patient’s blood was used. This blood product, using the patient’s autologous blood, is procured just prior to the procedure and is exactly like the blood draw that we are all familiar with from visiting the family physician. The PRF is extracted by centrifuging the blood in a specialty device. It is immediately inserted into the maxillary sinus along with the implants. Following a short healing period of 3 months, the PRF is completely replaced with the patient’s own bone. This method achieves the patient’s autologous, natural bone growth. Literature: Tajima, N., et al. (2013), “Evaluation of Sinus Floor Augmentation with Simultaneous Implant Placement Using Platelet-Rich Fibrin as Sole Grafting Material.” The International Journal of Oral & Maxillofacial Implants 28(1): 77-83. We have been offering this procedure at our practice since 2013 and have seen very good results in conjunction with special implants that facilitate growth through the bone via the implant. Combined with another method, “photofunctionalization” of implants, we are achieving unparalleled levels of fastness with implants, even after a sinus lift procedure, and a healing period of only 3 months. PRF or platelet rich fibrin is a blood product sourced from the patient’s own blood and can be extracted at the practice. PRF is obtained just prior to or during a surgical intervention (implant, wisdom tooth surgery, tooth extraction, etc.). Via a simple blood draw, like the one you get when visiting your family physician, vials of blood are taken. 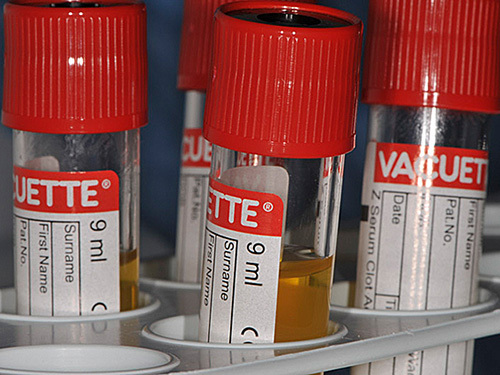 Centrifuging these vials in a specialty device enables the procurement of PRF. PRF consists of the fibrin matrix of blood (fibrin net), which contains a concentration of blood plasma, platelets, and a variety of growth factors that act as healing agents. In many cases, PRF may improve healing and/or accelerate it. Literature: Li, Q., et al. (2013). “Platelet-rich fibrin promotes periodontal regeneration and enhances alveolar bone augmentation.” Biomed Res Int 2013: 638043. Naik, B., et al. (2013). “Role of Platelet rich fibrin in wound healing: A critical review.” J Conserv Dent 16(4): 284-293. Hauser, F., et al. (2013). “Clinical and histological evaluation of postextraction platelet-rich fibrin socket filling: a prospective randomized controlled study.” Implant Dent 22(3): 295-303. Implants made out of titanium “age” immediately following their manufacture. It is well known that titanium implants lose the majority of their beneficial biological features shortly after their manufacture: surface polarity reverses so that water, blood, and also cell/protein structures can no longer adhere to the surface of the implant. This also explains why human bone can integrate with only approx. 45-50% of the titanium surface of the implant (BIC – Bone-Implant-Contact). Our own clinical experience shows that implants treated with this method prior to placement into the bone evidence significantly higher values in fastness than untreated implants. Studies have shown that these “aged” implant surfaces immediately regain their original beneficial qualities if they are exposed to ultraviolet light (UV-C) just prior to placement. the implant surface can be moistened, the surface polarity reverses again so that blood and cell/protein structures can reach the implant surface. The effect is remarkable! The implant surface acts like a magnet on the proteins and cells, since the surface can now be fully reached by them. In animal trials, the rate of bone augmentation increased from 50% to 95%! We are actively engaged with clinicians and researchers at UCLA (University of California, Los Angeles, USA) and are one of the first practices in Europe to offer this procedure. When placing implants that facilitate bone growth, we have found that in sinus lift surgeries conducted only with the PRF process as fill agent, we have been able to achieve values in fastness that surpass even those of implants secured in very hard/dense lower jaw bone. A drop of water is easily observed on the untreated, water-repellent side; the other side was treated with UV-C light and does not evidence the formation of drops, but a superhydrophilic implant surface that absorbs water. The titanium surface is fully moistened with water.